It is refreshing to see homegrown brands like Scolarian come up with cycles for the Indian market. They clearly have their goals set on making the best fixed gear bicycles. We got the oppurtunity to test ride the Scolarian Hermit 05 2015 and here is what we thought. The frame in the Scolarian Hermit 05 2015 is built with Chromoly AISI 4130 Double Butted Alloy Steel, neatly welded and nicely finished. Riding the Hermit 05 is a mixed bag. Its light weight is welcome, yet the combination of a super-rigid frameset and straight bladed steel fork makes it a teeth-rattling ride over rougher surfaces. This is fine for smooth roads, but as a lot of our streets are rough and potholed this can soon become uncomfortable. Frame geometry is appropriate for the urban ride with handling more suited to cruising public streets than hitting the highway. 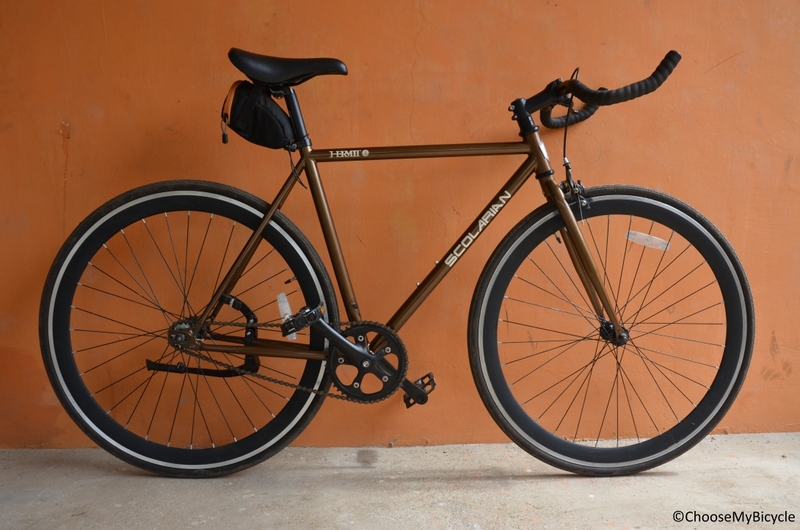 The Scolarian Hermit 05 2015 is a fixed single gear bicycle. The fixed gear is what differentiates the Hermit 05 from other multi-geared hybrid bicycles. 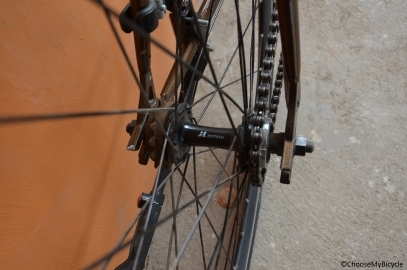 The 'fixie' as these type of bicycles are called, is equipped with a Joytech Sealed Bearing Flip Flop rear hub. The fixed gear cog makes sure that the rider cannot stop pedaling, in other words the rider cannot coast. If you pedal forward it moves in front and when pedaled back it moves backward, as simple as that. This highlight component on the Hermit 05 helps those who do not fancy riding fixed all the time, the flip-flop hub gives you the option of experiencing freewheeling single speed action by just flipping the rear hub. 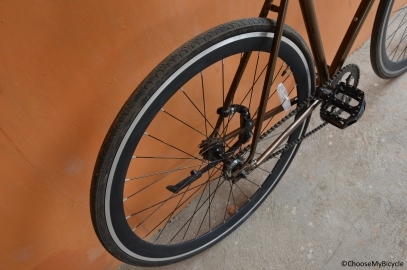 Like most of the fixed bicycles around the world, the Hermit 05 comes with only the front V-brake. The brake pads are wide enough and react quickly which is important while attaining higher speeds while on the fixed gear mode. 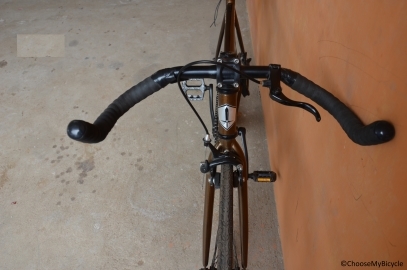 The brake levers are also conveniently placed for comfortable hand placement. Rear V-brake can be purchased separately as a component. Fixed bicycles are known to a have good fan following abroad with a culture building around them. It is clear that the popularity of fixies and single speed bicycles shows only a upward swing from now in our country. 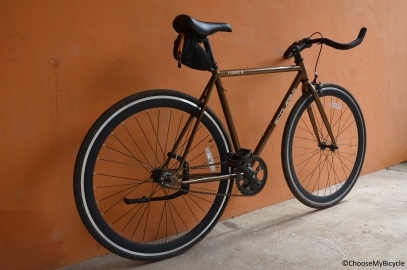 Scolarian Hermit 05 2015 is a classic bicycle with a professional look which comes with a glossy copper finish and black rim. Scolarian is an Indian brand which all of us can be proud of. With a lot of technical knowledge which has gone behind every fixed bicycle they manufacture, we can expect world class bicycles from them in the coming years. We would like to thank Scolarian Bikes and Tanmay Verma for providing us with the bicycle for this review.